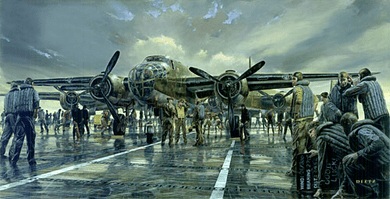 James Dietz Hand Signed and Numbered Limited Edition Print:"Early Launch"
Size: 28" x 14 1/2"/ Overall Size: 34" x 21"
About the Art: One of the most daring aviation exploits of the Second World War took place on the 18th of April 1942. Led by Lt. Colonel James H. "Jimmy" Doolittle, sixteen Army B-25s took off from the crowded deck of the U.S.S. Hornet and headed for their targets in Japan. This guts-and-glory mission was the culmination of four months of planning, hard work and training for the 90 volunteer crewmembers that would fly the extremely dangerous mission. It was designed not just to strike at the heart of Japan, but to bolster the sagging morale of the United States in the dark early months of World War II. It would also force Japan to reconsider its defense of the empire and lead its military into its first strategic mistake, the decision to take Midway. Assisted by Naval experts, principally Lt. Henry Miller, the "Army Crows," as they were called, started practicing carrier deck take-offs in March 1942, with their medium bombers at Elgin Field in Florida. They would need all the practice they could get. It would be the first time such large bombers would be launched from a Navy carrier on a combat mission. By the end of the month, they were ready and flew cross-country to hook up with the Navy task force waiting for them in Alameda, California. On April 1, the aircraft carried U.S.S. Hornet had been loaded with the bombers and set sail from its berth to meet the rest of its task force in the Pacific. During the next tension-filled days its proceeded to the desired launch site for the Army bombers, and for the next seventeen days, the task force sailed deep into the Japanese controlled waters. The bombers were to be launched late in the day on the 18th, close enough to Japan that they could continue east and conduct emergency landings on makeshift airfields set up for them in China. Unfortunately fate had other plans. A Japanese picket vessel sighted the task force at 7:38 a.m. Although this ship was eventually sunk by Navy gunfire, it was decided to quickly launch the Army Raiders and get the carrier task force out of harm's way, even though they were well short of their desired launch point. The B-25s had been "spotted" on the stern of the Hornet, to give them the longest possible distance for the deck launch. Frantic last minute preparations were made including additions to armament, topping off gasoline tanks and giving out extra fuel cans in hopes of making up for the additional distance they would have to fly. Navigators reviewed their maps to make the necessary adjustments in their flight plans, while pilots and co-pilots worried about their first actual carried takeoff with fully loaded B-25s. In Early Launch, Colonel Doolittle and his co-pilot, Lieutenant Richard E. Cole, who were to be the first to take off, discuss last minute instructions with Lieutenant (U.S.N.) Edgar Osborne, who was to be Launch Officer for the take-off. Other Army personnel scramble to their planes while Navy deckhands man their assigned positions for launch. All the aircraft were successfully launched off the pitching deck of the Hornet and, despite some opposition in route, reached their targets. The Japanese cities of Tokyo, Yokohama, Nagoya, Osaka and Kobe were completely surprised by the sting of U.S. air power. The entire empire of Japan was shocked by the first of what was to become many U.S. bomber raids over its cities. The B-25s continued southeast to China where, late at night, the crews bailed out of the aircraft that were nearly out of gas. Two crews were captured by the Japanese and made to endure torture, imprisonment and death at the hands of their captors. One crew was interned in Russia, but the other crews, with heroic help from the Chinese, eventually found their way to Chungking. From their they were flown out of China and back to the United States. Many details of the raid had to be kept secret from the American people. Roosevelt even quipped that the bombers had been launched from Shangri-La, the mythical kingdom in Last Horizons. But news of the first bombing raid on Japan, even with minimal damage, was a tonic to all Americans, who were just getting over the shock and humiliation of the Japanese surprise attack on Pearl Harbor and subsequent losses all over the Pacific. It was as it to signal the changing tide. To paraphrase Winston Churchill, "It was not the Beginning of the End, but perhaps the End of the Beginning."